Global Wastewater Recovery Systems Market size will exceed USD 50 Billion by 2024, as reported in the latest study by Global Market Insights, Inc. Growing initiatives toward minimizing the ecological impact of waste coupled with the introduction of stringent waste generation and discharge standards will augment the wastewater recovery systems market. Growing measures to counter the declining water resources will complement the industry landscape. The U.S. wastewater recovery systems market is anticipated to expand over 7 % by 2024. Increasing stringency of wastewater regulations along with rigorous implementation of effluent discharge standards will propel the industry growth. For instance, the EPA Clean Water Act prohibits the discharge of a pollutant into the U.S. waters without a National Pollutant Discharge Elimination System (NPDES) permit. Shifting global trends toward circular economy and sustainable development will play a pivotal role in the expansion of the wastewater recovery systems market. Ability to recover usable water, energy, and material from wastewater can allow businesses to enhance their competitive capacity and environmental performance. The gradual implementation of the EU Circular Economy Strategy will further support the industry outlook. Europe wastewater recovery systems market is anticipated to witness a growth of over 6 % by 2024. The industry expansion is characterized by rigorous implementation of environmental & wastewater regulations along with escalating focus toward green industrial ecology. For instance, the EU Water Framework Directive outlines the ‘3R’s’ approach of reduce, recycle, and reuse, in addition to the precautionary and polluter pays principles. Sizeable investments across food processing plants along with growing consumer inclination toward processed food will stimulate the deployment of these systems across food & beverages industry. Tightening operational regulations and rising compliance costs will further favor the industry growth. Rising health and environmental concerns over inadequately treated waste will stimulate the wastewater recovery systems market. Increasing public awareness supported by the simultaneous manifestation of stringent legislative standards for improved health & environmental protection further complement the business landscape. Saudi Arabia wastewater recovery systems market is set to grow on account of rising investments toward green industrial infrastructure in the country. Expanding eco-industrialization aimed at water reuse, lower power consumption, material recovery, and reduced environmental & health impacts will favor the industry outlook. For instance, the Saudi Arabia Al Kharj industrial eco-park project is proactively demonstrating the efficacy of wastewater recovery solutions. 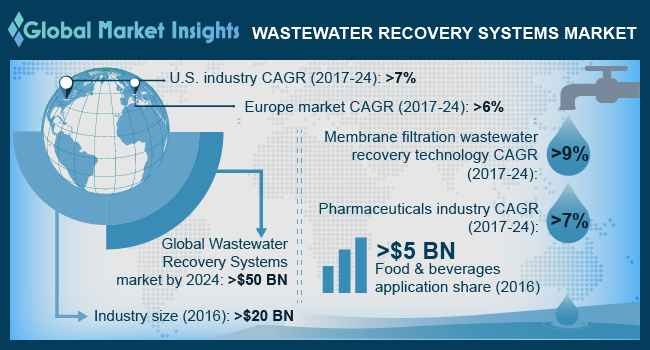 Significant technology advancements along with expanding application spectrum will fuel the media filtration wastewater recovery systems market growth. Recent innovations including the development of multimedia filtration which allow high-quality water treatment at a significantly faster flow rate than the conventional media filtration processes will boost the technology penetration. Pharmaceuticals wastewater recovery systems market is anticipated to expand over 7 % by 2024. The industry growth is attributed to rising cost pressures, rigorous environmental regulations, and other operational risks across these industries. Key industry players include SUEZ Environnement, Evoqua Water Technologies, Kontek, ClearBlu Environmental, Mech-Chem, Vinnolit, Dynatec Systems, Veolia, CLEARAS Water Recovery and others.